"We need to stop looking at children with disabilities for what they can’t do. We need to start with what they can do." A local teen is one example of just that. Listen. WASHINGTON — Rachna Heizer will never forget the time she was in the kitchen and heard the sound of nursery rhymes coming from the hallway. She assumed her 3-year-old was playing with a push-button toy, but when she turned the corner, she saw her then-nonverbal son figuring out familiar tunes on a miniature plastic piano. “He’d heard [the nursery rhymes] enough that he had memorized them and taught himself to play them,” said Heizer, a resident of Fairfax County, Virginia. A few years later, Jake taught himself pop songs on the guitar, followed by the drums. So Heizer found it strange that when Jake was in fourth grade, he was left out of his school’s talent show. “The children in his class weren’t even invited to audition because the school never thought that kids in a self-contained special education autism class could have any musical talent,” Heizer said. These days, Heizer said administrators at Jake’s high school call on the 16-year-old when they need someone to perform for school events. 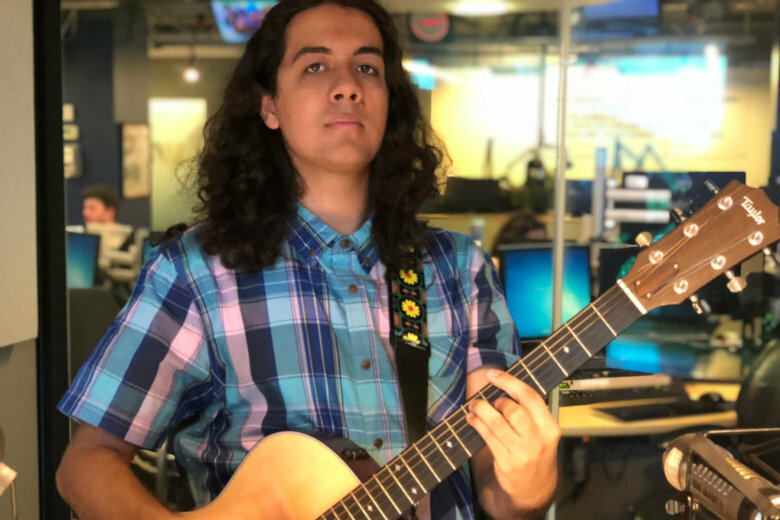 He plays in a band with his peers, takes music lessons after school, and has his sights set on Boston’s Berklee College of Music. But none of it would have been possible if Heizer didn’t tear through some red tape to take the spotlight off his disability and shine it on his ability. On Oct. 5, storytellers from across the country, including author Chimamanda Ngozi Adichie and KIND founder Daniel Lubetzky, will take the stage at the National Education Association in Northwest D.C. to reflect on the promise of public education. Heizer is one of the 15 invited speakers, and the story she’s sharing is Jake’s. According to the Centers for Disease Control and Prevention, about one in 59 children in the U.S. identify with autism spectrum disorder, and data from the National Center for Education Statistics shows about 90 percent of children with autism attend traditional schools. But Heizer said at school, students with disabilities often are not treated the same as other students, and that needs to change, especially when it comes to cultivating their strengths. “If there’s a kid who doesn’t have a disability, we look at them in kindergarten and say, ‘What is little Suzie good at? Oh, she’s good at math, so let’s foster that.’ Or, ‘What is little Johnny good at? Maybe it’s reading — he likes to read — so let’s give him more books.’ But when we look at someone like Jake who walked in fairly nonverbal when he started school, we look at, ‘Oh, he can’t talk, he can’t this, he can’t that. So let’s fix that,’” Heizer explained. Heizer, who serves on the board of the Virginia Autism Project, gives the example of Jake being denied a music elective because he needed social skills support. It took her seven meetings with the school to have them move his social skills intervention to study hall so he could have an actual elective. Soon after, Jake was playing in the high school guitar ensemble as a middle school student. “We have to stop pigeonholing our kids. … We need to stop looking at children with disabilities for what they can’t do. We need to start with what they can do. And I think that’s a blind spot our schools have and so I want to tell our educators we need to remove that blind spot,” said Heizer about her upcoming presentation at the NEA Foundation symposium. You can watch Heizer and the other invited speakers share their stories on the Keeping the Promise of Public Education Symposium livestream at 2:30 p.m. on Friday, Oct. 5. Jake will also perform at the event.